Emmerdale star Luke Tittensor has been sacked from the ITV show after he pleaded guilty to attacking a teenager. The 19-year-old, who plays Daz Eden in the soap, appeared in court in March and admitted inflicting grievous bodily harm on a 16-year-old. An ITV spokeswoman said the actor had been told his contract was being terminated because "we cannot condone criminal behaviour." She added: "Luke regrets his behaviour and understands this situation." 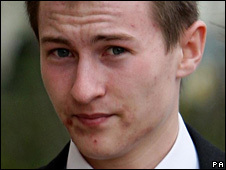 Tittensor appeared at Bolton Crown Court where he pleaded guilty to fracturing the teenager's jaw. He is due to be sentenced on 29 April. The court heard how the boy had been left badly injured and needed surgery after the attack. Tittensor has been in the cast of the soap since he was 13 and his last episode will be broadcast on Friday.